This study focuses on teacher job satisfaction in Modern Orthodox Jewish day schools and how it is impacted by a teacher’s perception of their supervisor’s word-deed alignment, also called “perceived behavioral integrity,” the extent to which a supervisor’s behavior matches the values and vision he or she articulates. The literature suggests that there is a strong relationship between perceived behavioral integrity, trust, and job satisfaction. Based on surveys of 230 full-time teachers in Modern Orthodox Jewish day schools, this study considered the degree to which perceived behavioral integrity predicts teacher job satisfaction, taking the role of trust into account. It also investigates predictors of perceived behavioral integrity, with a focus on supervisory guidance (the degree of supervision provided to the teacher), frequency of mission communication to the teacher (the degree of communication about the mission to the teacher), and length of a teacher’s tenure in their current position. 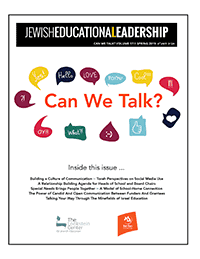 This study calls to the attention of day school leaders – both lay and professional – perceived behavioral integrity, given the significant implications for Modern Orthodox Jewish day schools, including retention of teachers, teacher performance, and teacher attitudes. To read this dissertation, click here.